Topics: Aaranyak, Objectives, Programmes, Events, Conservation Projects, and Divisions & Units. 9 users visit the site each day, each viewing 2.00 pages. 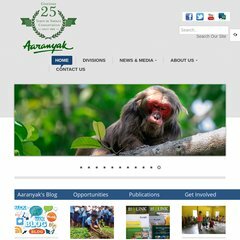 Aaranyak.org's IP address is 74.220.215.56. It has 2 DNS records, ns2.hostmonster.com, and ns1.hostmonster.com. It is hosted by American Registry For Internet Numbers (Virginia, Chantilly,) using Apache web server.